International Women's Group and Peace Corps Volunteers work hand in hand to support mamas on Emae, Epi and Paama. 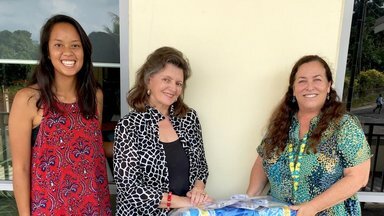 This year Peace Corps Vanuatu has been recipients to a number of donations of brand new sewing machines, rolls of calico, threads and scissors from the International Women’s Group (IWG). These sewing machines and supplies have immensely impacted women’s groups especially on Emae, Paama and Epi where three of our lucky volunteers serve. There is Taylor on Emae, AJ on Paama and Phevee on Epi. These donations have now paved the way for promoting income generating activities that will improve the livelihood and well being of mama’s in their respective communities. 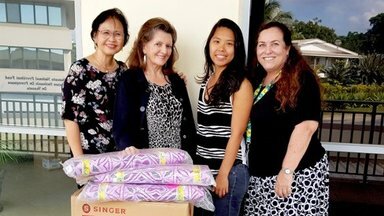 The International Women’s Group began in 1988 for expat women to get together in support of each other and then in 1992, became involved in fundraising for projects to benefit Ni-Vanuatu women and children throughout Vanuatu. Until now, the IWG has financed countless projects across the country. AJ (left) receiving donation on behalf of the mamas on Paama. The IWG provides the means for women to earn money by way of cooking pots, utensils, etc., sewing machines, calico, etc., to support their families. They have also assisted with furniture items for aid posts and items in village schools. For many years, IWG had not only taken Christmas gifts to the Vila Central Hospital (VCH) Children’s Ward but also more recently, have taken or sent Christmas gifts to Hospitals on other islands as well. Not to mention, IWG have also done some major refurbishments at the VCH Children’s ward and helped in the disability sector. Women of all nations are involved in IWG including Vanuatu, Australia, Philippines, Japan, Thailand, India, Fiji, New Zealand, France and China, to name a few. IWG welcomes new members of all nationalities; IWG is a great place to make friends. “I must say that our connection with Peace Corps has not only been very helpful to us and the Mamas, but it has been a pleasure for us to meet Peace Corps volunteers; all a breath of fresh air” said Kathy, Vice President of IWG. 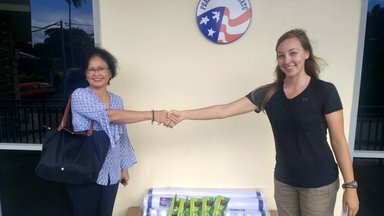 Peace Corps Vanuatu is forever grateful with the support they have received thus far from the IWG and would like to thank them for believing and supporting their three volunteers support their communities.